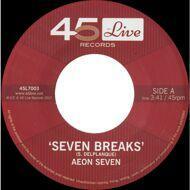 45 Live DJ Team member Aeon Seven from northern France drops his first single 'Seven Breaks' on the label, a straight up BBoy jam aimed squarely at the Dancelfoor. A driving uptempo funk/breaks joint, all written by Aeon with heavy bassline, organ riffs, badass breakdown and tasty cuts and scratches. A peak time cut that any block rockin' DJ needs in their crates!